Several manufacturers are acquiring or merging with key companies to expand their product portfolio and increase market share in the Australia & New Zealand herbal supplements market. The new report of Persistence Market Research titled “Herbal Supplements Market: Australia & New Zealand Industry Analysis and Forecast, 2017–2025,” explains that many manufacturers are launching new products or repositioning existing brands to reflect current market trends. The analysts have targeted the products while inspecting the Australia & New Zealand herbal supplements market and have observed that demand for digestive and heart health supplements is increasing and thus, the segment is growing in a robust and consistent manner over the estimated period. Besides, tablets and capsules are the popular form of herbal supplement products. The manufacturers in this market have followed various strategies and one of the key differentiation strategies is offering products with enhanced functional properties. Offering more convenient and natural ingredient-based supplements is also a major trend of manufacturers in the Australia & New Zealand herbal supplements market. 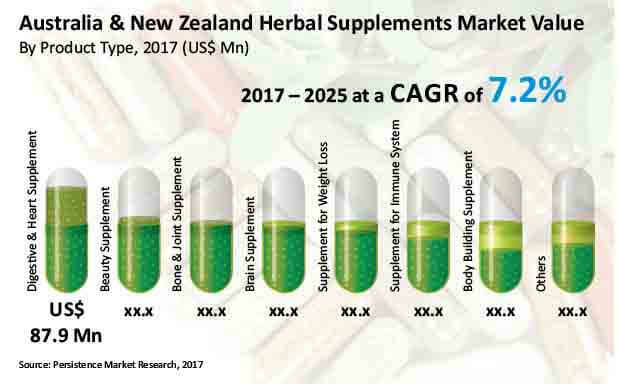 The study demonstrates market dynamics that are expected to influence the current environment and future status of the Australia & New Zealand herbal supplements market over the predicted period. The primary objective of this report is to offer updates on trends, drivers, restraints, value forecasts, and opportunities for manufacturers operating in the Australia & New Zealand herbal supplements market. The report analyzes the market share of the Australia & New Zealand herbal supplements market on the basis of product type and form. The report highlights the country-wise demand for herbal supplements and provides a market outlook for 2017–2025, setting the forecast within the context of the herbal supplements ecosystem, including the new technological developments as well as product offerings in the Australia & New Zealand herbal supplements market. This study discusses key trends contributing to the growth of the Australia & New Zealand herbal supplements market as well as analyses the degree to which drivers are influencing the market. The report begins with the market definition, followed by definitions of the different herbal supplements in the Australia & New Zealand herbal supplements market. The market dynamics section includes Persistence Market Research’s analysis of key trends, drivers, restraints, opportunities and macro-economic factors influencing the growth of the Australia & New Zealand herbal supplements market. Also, the pricing analysis of different products is mentioned for upcoming herbal supplements. The report analyzes the Australia & New Zealand herbal supplements market and presents a comprehensive forecast by value for the next eight years. The different segments of the Australia & New Zealand herbal supplements market have been analyzed by basis point share (BPS) to understand segmental contribution to market growth. This detailed level of information is important for identifying various key trends in the Australia & New Zealand herbal supplements market. Finally, a competitive landscape has been included to provide report audiences with a dashboard view. Key categories of providers covered in the Australia & New Zealand herbal supplements market report include herbal supplements raw material suppliers and key players. Detailed profiles of the providers are also included in the scope of the report to evaluate their long-term and short-term strategies, key offerings and recent developments in the Australia & New Zealand herbal supplements market. Various barriers to entry in the industry are analyzed and rated on the basis of their impact on the competition level in the market. The analysts at Persistence Market Research have not only conducted market forecast in terms of CAGR but have also analyzed the Australia & New Zealand herbal supplements market on the basis of key parameters such as year-on-year (Y-o-Y) growth to understand the predictability of the market and to identify the right opportunities across the market. Another key feature of this report is the analysis of all key segments in terms of absolute dollar. Absolute dollar opportunity analysis is critical in assessing the level of opportunity that a provider can look to achieve, as well as to identify potential resources from a sales and delivery perspective in the Australia & New Zealand herbal supplements market. In 2017, the digestive and heart supplement segment is estimated to be valued close to US$ 90 Mn and is expected to expand at a CAGR of 8.5% over the forecast period to reach more than US$ 150 Mn by the end of 2025. This segment is estimated to create an absolute $ opportunity of close to US$ 5 Mn in 2017 over 2016, and incremental opportunity of a little more than US$ 80 Mn between 2017 and 2025. The digestive and heart supplement segment is anticipated to account for a relatively high revenue share by the end of 2025. This is attributed to a high demand for herbal supplements for application in digestive and heart products by adults in Australia & New Zealand. Increasing consumer inclination towards maintaining a healthy lifestyle has led to higher consumption of food and food ingredients with potential health benefits. Adults in Australia are more inclined towards herbal supplements as consumption of these supplements does not have any side-effects, aids in improving immunity, etc. Digestive and heart supplements are expected to gain more popularity in the herbal supplements market in the region as a result of the increasing demand for heart health supplements by consumers in Australia & New Zealand. Increasing digestive and heart supplements product penetration through online retailing channels is a major factor driving segmental growth. Sales of digestive and heart supplements through e-Commerce is further anticipated to witness significant growth over the forecast period owing to the higher adoption of smartphones and increasing internet penetration in the markets of Australia and New Zealand. This expected growth is attributed to the easy availability of a wide range of products and ability of customers to compare prices of various products available in the market during online searches or through social networking platforms. With increasing consumer demand for herbal digestive and heart supplements, key players are entering into partnerships/agreements and strategizing through acquisitions in order to increase their herbal supplements production capacity and are enhancing their distribution network to expand their footprint in the global market. Consumers are rapidly shifting towards consumption of herbal supplements for prevention of health issues. A growing number of consumers are consuming herbal supplements to prevent chronic conditions such as cardiovascular disease. A large number of consumers are consuming health supplements to prevent common ailments such as digestive problems. Consequently, the demand for digestive and heart supplements to prevent diseases has shown robust growth in the last few years across Australia and New Zealand. One of the major restraints for the growth of the digestive and heart supplement segment is increasing consumer preference towards conventional supplements that show rapid results as compared to modern digestive and heart herbal supplements. The availability of pseudo herbal products in the market is a major challenge for manufacturers of digestive and heart herbal supplements. These are conventional herbal supplement products that are marketed as herbal supplements due to the presence of some herbal ingredients. Many consumers are unable to distinguish between herbal and conventional supplements. This results in a considerable number of consumers opting for pseudo herbal products, which is a major factor hampering the growth of the digestive and heart supplement segment in the Australia & New Zealand herbal supplements market.